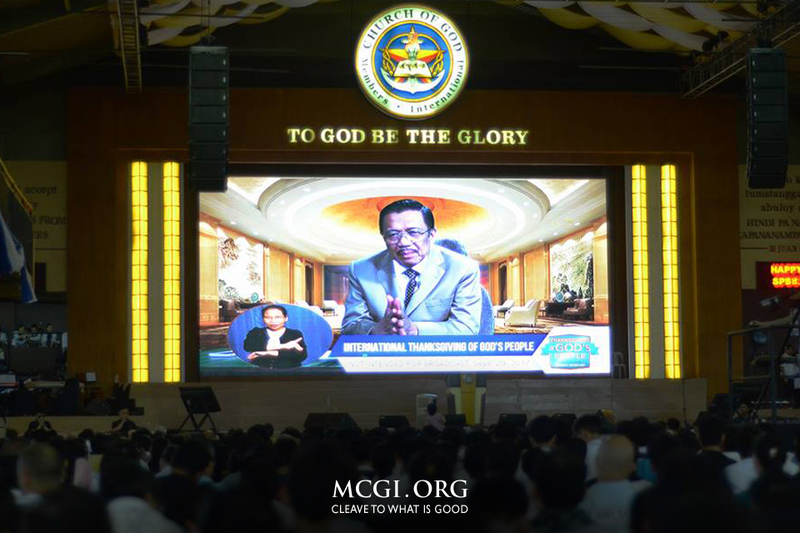 Apalit, Pampanga (10/9/2016) — Prompted by the bountiful blessings felt and new biblical wisdom learned during the three-day quarterly Thanksgiving of God’s People (TGP), the Members of the Church of God International (MCGI) once again celebrated another day of thanksgiving to God. Also referred to as the Special Thanksgiving of God’s People, this activity is when MCGI once again celebrate through thanksgiving the God-given opportunity to join tens of thousands of congregants for three days of TGP and listen to God’s wisdom. The congregation held theirs on October 9, a week after their last quarter’s TGP last September 30 to October 2 this year. “Have we received bountiful spiritual blessings during our three-day thanksgiving? If our hearts answer ‘Yes, we did — we received bountiful spiritual blessings!’ then join us in another International Thanksgiving!”, enthused Bro. Daniel during the last second quarter TGP. In previous quarters and years, a TGP is celebrated whole day for three days. For this quarter’s TGP, MCGI adopted the new, shorter time slot that started at 5 p.m. (Philippine Time) and lasted for five to six hours each day. The special TGP, meanwhile started at 6 a.m. and was adjourned at 12 p.m. (Philippine Time). Overall Servants to MCGI Bro. Eli and Bro. Daniel introduced the new time slot during the first quarterly TGP in April this year, in hopes of accommodating the growing members in foreign shores with varying time zones. With almost 1,200 remote points connected via satellite technology, brethren and visitors from all over the world attended the back-to-back international thanksgiving events. The bulk of attendees came from the ADD Convention Center in the Philippines. The three-day celebration was teeming with biblical wisdom through the topics delivered by MCGI Overall Servants, Bro. Eli Soriano and Bro. Daniel Razon — the event’s major highlight. Bro. Daniel Razon, Assistant Overall Servant to MCGI, delivers the biblical topic during the Special Thanksgiving of God’s People (TGP) celebration held last October 9. The special one-day TGP followed the three-day quarterly celebration of Thanksgiving of the Church. Brethren and guests jotted down notes and read along Bible verses as Bro. Eli and Bro. Daniel delivered topics ranging from the true essence and meaning of the name of the Father, as well as the events leading up to and during the millennial reign of Christ. “I am overwhelmed,” exclaimed Sis. Kyla Marcaida, a youth member from Quezon Province who journeyed all the way to the convention center in Apalit, Pampanga to join the Thanksgiving — more or less a 265 km travel by land. “I am very much thankful for the wisdom and learnings that I was able to hear. It was a well-worth-it sacrifice to come all the way [here to Pampanga] to join the congregation in hearing God’s words,” remarked Sis. Kyla. Aside from hearing biblical wisdom, the event’s attendees were also given opportunities to ask questions to Bro. Eli himself. Questions asked during the consultation segment of the TGP stemmed from the topics discussed per day. One of the attendees who asked Bro. Eli a biblical query was no other than the Philippines’ one and only Superstar, Ms. Nora Aunor, who graced the event and lauded Bro. Eli’s preaching. Filipina actress and superstar, Nora Aunor, smiles and claps as she listens intently to the serving of the biblical topic during the 3rd day of the Thanksgiving of God’s People event. In return, the MCGI Overall Servant expressed his gratitude to the actress for her attendance. “I am glad to have seen this day and we are glad to have you here,” said Bro. Eli who then proudly declared that he is a fan of the multi-awarded media personality. The televangelist answered the actress’ question regarding the difference between MCGI and other religions. On social media, the subsequent Thanksgiving of God’s People events consistently landed on the Philippines’ top trending spots on the social media platform Twitter. The official hashtag for TGP Day 1, #MCGITrulyGrateful, reached the 5th spot, while the hashtags for the second and third day, #MCGIOneInThanksgiving and #LightShinesInMCGI reached the 3rd and 2nd spot, respectively. The special one-day TGP event’s official hashtag, #HappyPBB, reached the no. 1 spot on the Philippines’ trends and was a trending topic for several hours. Thousands of brethren and guests from different parts of the country and even abroad shared their many reasons of thanksgiving to God, using photos, videos clips, and even voice quips via Quipsphere .